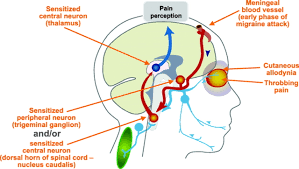 Trigeminal Neuralgia is described as facial pain that feels like a shock of electricity. It is dubbed the “suicide disease” due to the fact that it is so severe some patients chose to end their life rather than deal with the pain. This disease is serious and the people that suffer from it often have a terrible time dealing with healthcare providers because it is a rare condition and not very well known. TN is a condition that I have studied extensively and it is a specialty that I work with. In fact I have created a theory as to how and why TN occurs. Very often TN comes on after a trip to the dentist. My hypothesis is that the dentist accidentally hits the inferior alveolar nerve, which sends a shockwave through the nervous system. This causes sub-occipital muscles in the neck to tense up like they never have before, and these muscles actually pull the bones in the neck out of their proper alignment. 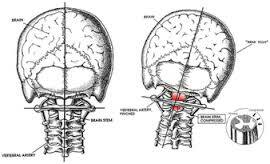 This pictures demonstrates spinal misalignment and how it effects the trigeminal nucleus. The Trigeminal Nucleus extends from the brain into the spine all the way beyond the second bone in the neck. Once the shockwave has done the damage to the muscles and bones in the neck they are likely to stay there unless corrected. The pain that TN sufferers experience is actually a defense mechanism to let them know it is very important that they never let anyone touch their face again with a drill. The body is trying to protect itself.